The IBM? Flex System? Storage Expansion Node is a locally attached storage node that is dedicated and directly attached to a single half-wide compute node. 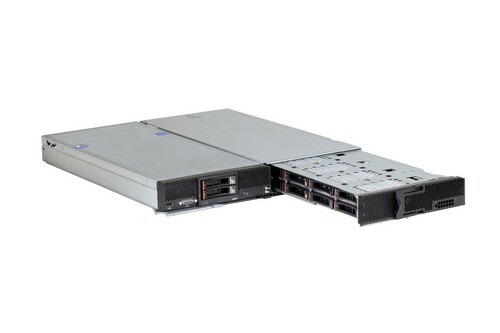 The Storage Expansion Node provides storage capacity for Network Attach Storage (NAS) workloads, providing flexible storage to match capacity, performance, and reliability needs. The Storage Expansion Node adds 12 drive bays to the attached compute node and all bays in the expansion node are hot-swap. The drive bays slide out on an internal rail system; provided that a suitable RAID level is employed, a failed drive can be removed while the system is still running. With storage capacity of up to 12 TB, the Storage Expansion Node is ideal for applications that can use large amounts of additional local storage. Ideal workloads include distributed database, transactional database, NAS infrastructure, video surveillance and streaming solutions. * Supports RAID 0, 1, 5, 10, and 50 as standard. JBOD also supported. Optional RAID 6 and 60 with a Features on Demand upgrade.